Hello Loves! There are few things more humbling than a nail art fail. Today's nail art is certainly a fail. 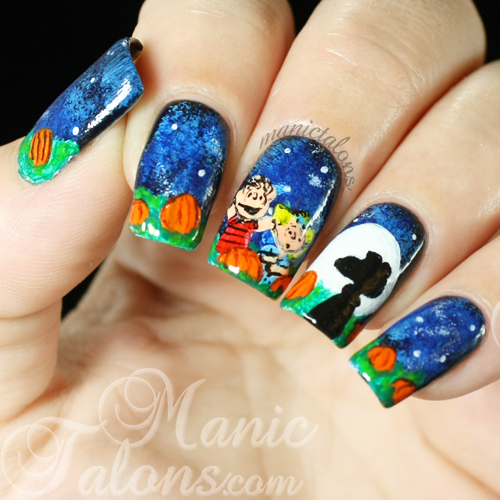 Last year, I created a mani based on It's The Great Pumpkin Charlie Brown. Ah, such a great Halloween special and one that we watch non stop during October. 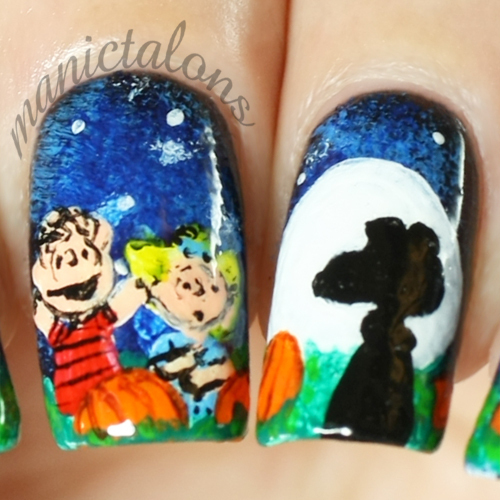 We're pretty big Peanuts fans around here. So...I decided to try it again this year. 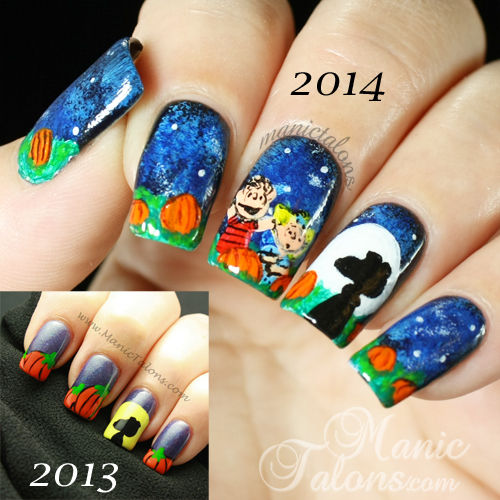 First, let's take a look at the mani from October 2013. Not bad for my first real attempt with acrylic paints. Pose is a little awkward, but the art is solid. Now let's talk about this year's attempt. Ok, I admit it...I was feeling pretty confident. My skills have surely improved over the past year, right? So instead of replicating the design from last year, I decided I would try and improve it. Oh yeah, I'll do the entire scene this time. All in acrylic paints over a black gel polish base. It's going to be epic. *Sigh* It certainly is epic...an epic fail. I know, it doesn't look too bad in the collage above. Let me show it to you a little larger. Ok, so I was off to a pretty good start. The base looks good. Moon is nice and round-ish. Pumpkins and grass were shaping up ok. Even the general shape of Linus and Sally are pretty close. Then things turned south. Poor Snoopy. Someone clearly stepped on his nose, turning his pretty round head into a football. But it fell apart even worse from there. How? Fine detailing. Yep. That pumpkin patch went from being the "most sincere" to rotting. And Linus...apparently he has gout in his left arm. But the real kicker is Sally. Poor little Sally. She clearly picked up a heavy drug habit somewhere along the way. Don't believe me? Let's take an even closer look. This doesn't look that bad from where I sit Michelle. But there is a line that gets crossed when a design starts looking too busy. You know? One of my rules lately is a 50/50 idea of half nail color, half design to let the eye rest. Some of the best designs use a focal point, like a painting. Michelle, Don't be so hard on yourself. I love it! Great job. I agree with the previous posts. I see more talent displayed on your pinky than I have in my entire body!! 😃 Sally's DTs can be attributed to witnessing the Great Pumpkin instead of crack withdrawal! What stands out to me is the improvement in your basic manicure skills. I want to know your secret to achieving that thin, professionaly-applied look. How do you avoid those bulbous tips/ sidewalls that are slightly evidenced in your 2013 version but are MIA in your newest vision? Hah. I still like it. After all, that's some super-fine detail! Looks good! :-) Interesting nail art. You are CRAZY. This looks awesome!